Made in 1 Day or FREE! When choosing between real wood and faux wood blinds here are some basic pros and cons of each type of window blind. 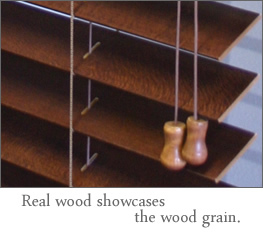 Made from synthetic materials so they are less expensive than real wood blinds. More durable. Faux wood blinds are perfect for homes with active children and/or pets. Resist moisture. Faux wood blinds are ideal for bathrooms and kitchens where they will be exposed to moisture and steam. Easy to clean. Because faux wood blinds can get wet they are easy to wipe down with a wet cloth. Look and feel like real wood. Stains showcase the wood grain texture in the blinds. Lighter than faux wood blinds. This is important for larger window blinds. Lighter blinds are easier to raise and last longer. Copyright © 2006 - 2019 Blinds Chalet. All Rights Reserved.